Autumn in Montana makes the Big Sky seem bigger and bluer. Perhaps all the bright colors—like the orange of pumpkins—beneath it have something to do with the sharpened hues. If you’re looking for the perfect place to pluck your piece of autumn, try one of these patches. They are our favorite places for picking pumpkins in Montana. Kalispell’s Sweet Pickins’ Pumpkin Patch is perhaps the premier pumpkin picking place in Northwest Montana. A self-described “autumn dreamland,” you and your family will find plenty of fall fun at this family-run patch. Besides picking pumpkins, you can browse their shop, drive the trike trail, or hop on the barrel train. Rocky Creek Farm is a popular pumpkin patch in the Gallatin Valley, which was acquired by Gallatin Valley Botanical Farms at the end of last year. The new owners pledged to keep the patch going so that local pumpkin pickers can find their fall fix. And they have done just that. Meadowlark Farm, near Hamilton, is an awesome spot for an authentic, autumn on-the-farm experience. While they do not get too carried away with the fall season, what they do offer is quality products grown right there on the farm. In addition to acres of you-pick pumpkins, Meadowlark also carried several varieties of gourds and bundles of decorative corn stalks for purchase. Yes, Field of Screams, near Victor, is the largest haunted attraction in western Montana. But when they’re not foisting fright on their willing victims, Field of Screams also happens to offer a pick-your own pumpkin patch. You can even enjoy a hay ride or bring the little ones for some non-scary time in the otherwise-haunted corn field. Just dipping its toes into the pumpkin patch waters, T&C Farms, near Laurel, first opened its patch to the public this year. 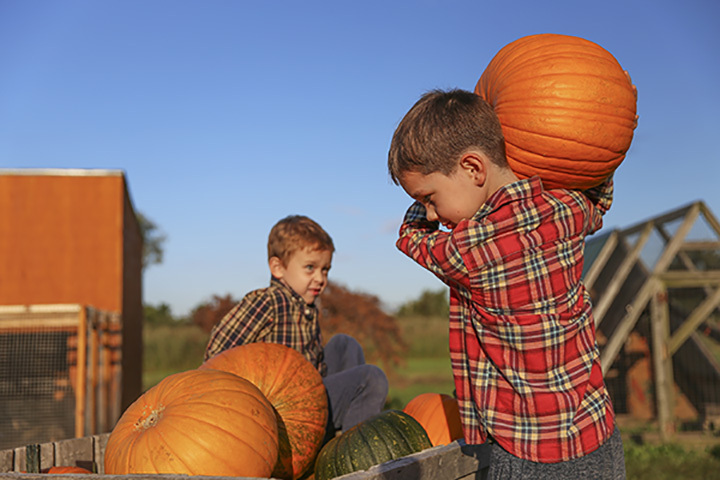 In addition to plenty of pumpkins for all who come, the farm also offers food and refreshments, a corn maze, hay rides, a country store and farm animals to visit. Folks near Vaughn head to Applestem Corn Maze and Pumpkin Patch to pick their pumpkins in the Montana autumns. Applestem offers a wide range of sizes and varieties. In addition to pumpkins, as the name implies, they also have a massive corn maze and several scheduled events throughout the fall season. West Mont Farm and Gardens is a project of West Mont, a nonprofit organization that helps house and offer vocational services for adults who live with disabilities. The farm has been open for more than a quarter century and proudly provides pumpkins to the purchasing public. A maze and petting zoo are also in the works.